Often we can fall into a rut regarding our duties. This is often the problem with webmasters and marketers. 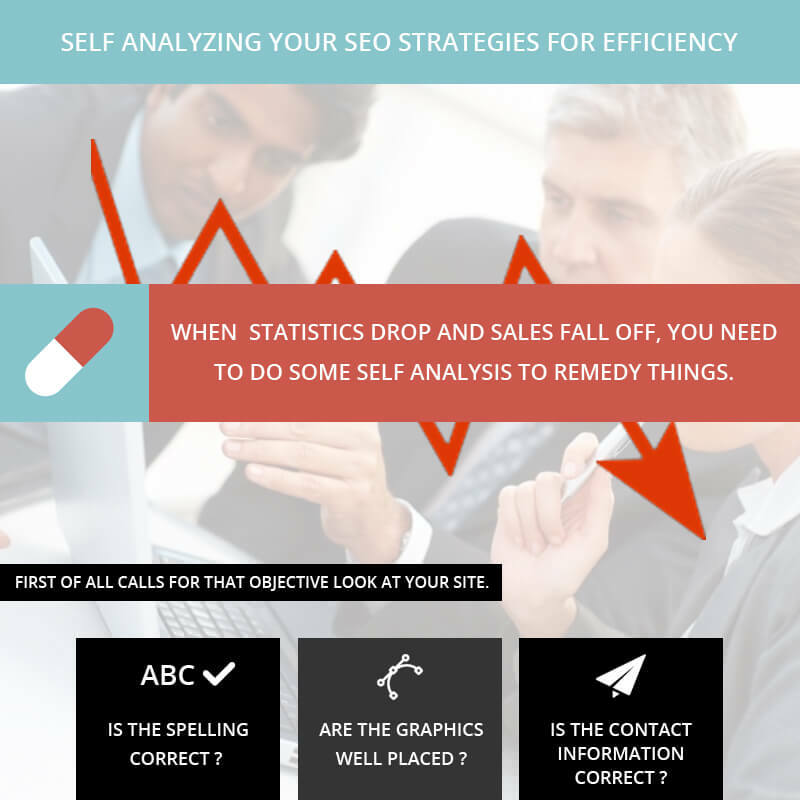 Putting together a great looking site and establishing a SEO strategy that works comes from clear thinking and due diligence, however, when those statistics drop and sales fall off, you need to do some self analysis to remedy things. Human arrogance can also be a major problem here. There’s no end to the number of webmasters and marketers who think they know everything and cannot make a mistake. They actually believe that they’ve achieved some deity like solution to all SEO and go on about their day not paying attention to the valuable data regarding the maintenance and expansion of their sites. Instead they just lollygag around and then when disaster strikes and they fall to pieces. You have to avoid this misery by taking a realistic look at your site and your own behavior to decipher when and where you’ve strayed off the beaten path. First of all calls for that objective look at your site. Is the spelling correct? Are the graphics well placed and described and tagged properly? Titles, contact information all correct? If not, then get right on the job to correct them. Any contact data that is in error is being posted elsewhere on the web and those links pointing to you had better be correct or you could end up in bad shape. Take a look at your personal and professional missions. Are your sites bringing you to those goals or away from them? This is highly important because one can make the mistake of being over confident with one’s present work and not realize there’s a need to tweak things, or a person can be over confident and not realize they’ve never even been near their full potential. This happens because of not being in the right presence of mind. Statistics allows for bringing a person to that present state of mind by showing in detail what is going on with a site and when. Using this valuable data to analyze and then implement modifications and corrections doesn’t leave much room for error except that in both personal and professional judgment. Don’t let nostalgia get in the way either. Yes that theme or process may bring back memories of the ‘good ol’ days’, but today is today and if it calls for more redesigning, then you had better hop to it. It’s the failure to not even get near one’s true level of equity that is worse than making a mistake here and there. Pride goes before a fall in statistics and not letting your head get too big is sound advice. Using communication here is a great way to remedy and prevent problems. Ask clients about their opinions regarding site design, service, professional management. Make an online questionnaire. Do whatever it takes to get the information about your products and services out there and accurately, with all the praise due. This shows Google that your site is vibrant and providing some solutions and value to surfers. You might want to think of your site as a place for people to visit and hang out. This provides a ‘welcoming’ sense of your site and surfers and customers will feel like your site and service are safe and comfortable place to be.